Here is a list of questions that many of our customers ask. Please read and if you have any further questions give us a call. A: The Aeroseal process won the "Best of What's New" award from Popular Science magazine, and the "Energy 100" award from the Department of Energy (DOE). The DOE also rated the Aeroseal duct sealing process as one of the 23 most beneficial technologies available to American consumers that has come out since the agency was created. -Q: Is the sealing guaranteed or can I get my money back? What if it doesn’t work? -Q: Can the Aeroseal air duct sealing system reduce the amount of dust in my home? -Q: Can the Aeroseal air duct sealing system reduce the noise made by the return and supply grilles in my home? -Q: Can the Aeroseal air duct sealing system help reduce my utility bills? -Q: If the rooms of my home have inconsistent temperatures, can Aeroseal improve the performance of my heating and A/C system(s)? -Q: Does the sealant leave an odor? -Q: Is the sealing material used by the Aeroseal air duct sealing system safe? -Q: Does the sealant coat the inside of the ductwork? -Q: Do air ducts need to be cleaned before air duct sealing? A: It's likely that the holes and cracks in the ductwork have allowed dust and other particulate matter to enter the system. If you are experiencing extensive levels of household dust, this might be the reason. 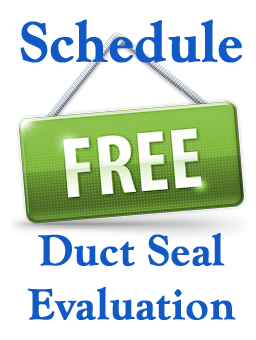 In most instances, duct cleaning is not found to be required prior to Aeroseal sealing. Your Aeroseal contractor can advise whether it will be necessary to clean your ductwork prior to sealing. -Q: How long will the air duct sealing material last? -Q: Does the air duct sealing material become brittle? -Q: In a nutshell, how does an Aeroseal air duct seal work? -Q: What are the estimated savings? A: A series of government reports have shown that air duct sealing can lead to up to $850 in energy savings per year. Some homeowners have saved up to 40% on their energy bill. Naturally, exact savings are difficult to precisely estimate since they depend on a multitude of variables such as your weather, house condition and design, your heating and air conditioning system, system usage – as well as other factors like energy prices. Also, all Aeroseal air duct certified technicians are qualified to run a program made by the Environmental Protection Agency (EPA) called “Duct Investor”. Duct Investor takes a comprehensive list of variables and provides a homeowner with the best available estimate of what they should realize in cost savings. -Q: What does the Air Duct Diagnostic and Inspection tell me? -Q: What size of holes can be sealed using the Aeroseal air duct sealing process? -Q: What About VAV Boxes and Fire/Smoke Dampers? A: Aeroseal generally avoids blowing sealant materiel through VAV boxes or fire/smoke dampers, however laboratory and field testing have shown that under the right circumstances this can be done without adverse consequences. Under no circumstances can sealant material be blown through VAV boxes with reheat coils. Should it be more practical to blow sealant through VAV boxes or fire/smoke dampers, it is recommended to consult with the engineers at Aeroseal LLC. -Q: What Types of Ducts Can be Sealed? A: Aeroseal is capable of sealing all types of ductwork, however the sealing rate varies with the type of ductwork. Sheetmetal ductwork seals most quickly, and internally lined ductwork seals most slowly. -Q: How Large of a Leak Can be Sealed? A: Aeroseal recommends sealing the leaks up to 5/8 inches across. Leaks more than one inch across can be sealed, however the sealing rate varies with the size of the leak times itself. In other words, the sealing time for a 1" leak is 64 times longer than that for a leak 1/8" across. Practically speaking, leaks larger than about 5/8" across are better suited to be sealed manually if possible. -Q: How Long Will the Seals Last? -Q: Is the Sealant Material Safe? -Q: How Does the Aeroseal Process Work? -Q: How Do I Know if the Ducts in My Building Need to be Sealed? A: The existence of duct leaks in your building can be uncovered several ways. One way is to examine Test and Balance reports, comparing the total flow through the grilles with the total flow through the air handler, or by looking for systematically low flows at grilles that are far from the fan. Another way is to test a sample of duct sections for leakage, a test that Aeroseal technicians perform on a regular basis. -Q: How Much Energy Does the Sealing Process Save? -Q: Why Should Ducts in Commercial Buildings Be Sealed?